Mace House is a beautiful family home in a quiet, secluded neighborhood, on the mainland side of the tidal creek at Pawley's, where moss hangs from live oaks and deer stroll in the evening. Located on the mainland across the marsh from the south end of the island, this house has a private dock on the frontage along the marsh and is still owned by the family that built it in 1972. 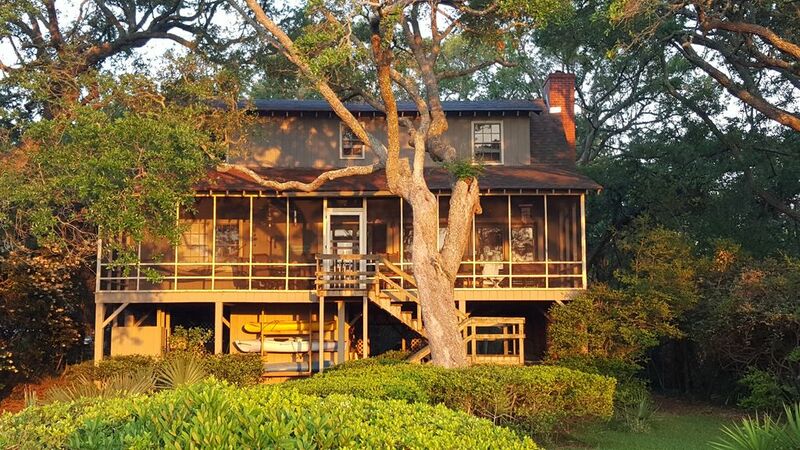 A large screened porch with hammock, swing, and rocking chairs overlooks the tidal marsh where the private dock gives access for crabbing, fishing, kayaking, and watching birds - egrets, herons, and osprey in the marsh and painted buntings and whippoorwills in the woods. Glass doors across the main room let you enjoy the glorious views in the comfort of AC or heat, or you can open them and bring the sea breezes into the house. This is a perfect place for a family to get away from the world and spend time together with our little collection of books and games, or with those you bring yourself. The house is large enough to offer privacy as well. Nearby are world-class golfing, shopping, historic homes and churches, and restaurants galore. The beautiful sculptures and gardens at Brookgreen are only a few miles north. Fifteen minutes takes you to Georgetown, half an hour to Myrtle Beach, and an hour to Charleston. We rent by the week only--no short-term rentals. For more details and many more pictures, please see our main website (linked below). Mace House is owned by Nancy Mace Kreml, Jane Mace Davis, and John Davis. Nancy and Jane are retired teachers: Jane taught math at Irmo High School and Nancy taught English at Midlands Technical College, both in Columbia. John Davis edited South Carolina Wildlife magazine, and now paints wonderful wildlife scenes. Jane and John also have a house near Brevard, NC, and Nancy (and her husband Bill) have an apartment in Chicago--but we all live in Columbia much of the year with cats, dogs, and other tame and not so tame animals! Our parents, Mary and Parke Mace, built the house in 1972, and our family has enjoyed it ever since. The marsh is the true heart of all our memories, and we're so happy every spring when the first warm evening lets us take cold drinks out to watch the sunset. Our parents and grandparents spent summers at Pawley's, and now our children and (future)grandchildren do, too. Pawley's offers beautiful beaches and marshes, fascinating history, great golf courses, excellent fishing and crabbing, and easy access to Georgetown, Murrell's Inlet, and Charleston, as well as the Francis Marion National Forest. We've always thought that paradise is in the marsh at Pawley's. When we're there, you'll always find us on the dock at sunset, eating supper on the porch, or curled up to read by the fire if the evening is cool. We always like to take a trip to Brookgreen or a nature tour at Hobcaw, eat out or buy fresh-caught seafood and cook it ourselves, play games or watch a movie, and best of all, kayak in the marsh to see egrets, herons, ibis, eagles and other wonderful creatures. And every summer, we swim in the perfect surf on Pawley's beach! Outdoor shower is enclosed, under house, with hot and cold water. We're about 15 minutes from the beach. You can drive by car or kayak across when the tide is right. The creek is beautiful at many times of the day. Use at own risk and you must clean if you use. Parking for up to four cars, with one under house. Wifi available. Information on refrigerator and in emails. part of great room, adjoining kitchen. Big glass doors with creek view. Part of great room--bar for eating, etc., separates kitchen from rest of room. One six-person table in kitchen, another on screened porch. One upstairs, one on main floor. Additional TV hookup in bedroom on main floor. Radio/CD player with bluetooth connection. One upstairs, one on main floor. Local history, plus various other mysteries, etc. Some older films available on DVD. Native plants, large grass lawn. Covered porches on both sides of house. Porch near creek is screened as well. The house is on stilts and there is a fairly high flight of stairs. However, once inside, there are bedrooms, bath, and kitchen on main floor. There is no elevator. Private dock on tidal creek (very low water at low tide, but plenty of water at high tide). Pets allowed with fee and owner permission. Mace house is an absolute charmer! It's tucked away perfectly in the marsh. The home had all the amenities that we could have wanted. The beds were very comfortable as well! The birds were plentiful as were the fish and crabs. I really enjoyed the photo oppotunities that I was afforded without having to get in my vehicle. My children loved the entire area but the marsh out front was the real winner along with the beach which is only a few minutes from Mace house. The screened in porch overlooking the marsh was amazing, spending our time out there watching the marsh was just sublime! The memories made here were priceless. We will most definitely be back here again! Thank you Mace house!!!! The photos and description do not even begin to convey how extraordinary this sea marsh retreat is ! An abundance of love and care have been invested in this home and surrounding grounds. No detail has been overlooked and Nancy, Jane and John went out of their way to make sure our experience was outstanding. We're so glad you had a good visit! It's home to us, and we always hope visitors will feel at home there, too. And glad you got to escape northern winter for an early southern spring. Thank you for staying in touch! Great house & the location was "just right" for kayaking the marsh. Very comfortable house w/ plenty of room. Spent lots of time fishing from the dock. Nice quiet street w/ friendly neighbors. We're so glad you had a good first visit, and hope you'll come back for many more. Fishing from the dock makes it very easy to catch a good supper, and our neighbors are always pleasant and friendly, so it's great that you were happy there! We have come down to SC often as we have family there. We have always rented a place on the ocean but decided to try the salt marsh. We are hooked. The Mace house was comfortable and we felt very relaxed. We fished and caught redfish, we even crabbed for the first time and caught 6. The many birds and the sunrises were spectacular. Loved the live oaks and again the quiet! This is where we will stay next time if Nancy will have us. So glad you found the charms of the salt marsh! It's so alive with birds and fish and animals and all kinds of things that are good to eat (as your crab catch shows), and it's very quiet and lovely every time of year. You are always welcome to come back! Jane and John and I are so happy to have repeat visitors, and there are many advantages. Just email us when you know the dates you want, and we'll work with the calendar. We have rented the Mace House many times and especially enjoy the porch and dock. The dead end road is quiet and even though there are houses on both sides, the house seems secluded. We enjoyed taking a morning walk in the neighborhood, but insect repellent was a must for us. The yard off the screened in porch is well kept and beautiful. We did not rent the kayaks this year, but have in the past. Paddling in the marsh is great fun! We're always so glad to have returning visitors, and glad that you found the house still a good place to stay! We too feel that we're comfortably away from the noise and bustle of highway and beach, and quietly enjoying the marsh and its beauties. So sorry about the need for bug repellent--the recent hurricanes have made 2018 an unusual year! The porch will be rescreened later this fall, along with other necessary upkeep, so everyone will be truly bug-proof there, at least. And hope you'll soon come back and take a kayak paddle into that truly secluded back marsh, where you can be out of sight of any houses, in a world with ospreys, eagles, egrets, and ibis! We love this place and have been back many times. So serene, great crabbing, and wonderful for bird watching. We are always so glad to know you're coming! We're very glad you like the quiet life with so much nature around you! Thanks for being great guests! We have kayaks to rent, all single-person. Thanksgiving, Christmas, and New Year's weeks are $1000 per week. Kayaks rental available at house. Deposit is actually 50% of rent, with the remaining 50% of rent and 100% of all other fees and taxes due 7 days before rental begins. We give $50 discount to returning renters. For Thanksgiving week ONLY, we rent Wed.-Sun. for $575 flat fee, OR the whole week for $1000 flat fee. Also, in January and February, we rent for periods of one to four weeks. Otherwise, we rent for one or two weeks, Saturday-Saturday, only.